TechPowerUp reports several high-end graphics cards and motherboards that require PCI Express bridge chips to expand the number of PCI Express lanes are delayed due to a shortage of PLX's PEX8747, world's only PCI Express 3.0 compliant bridge chip. Products suffering from the shortage include ASUS' Maximus V Extreme, the AMD Radeon HD 7990 dual-GPU card, the Radeon HD 7970 X2 cards and NVIDIA's GeForce GTX 690. 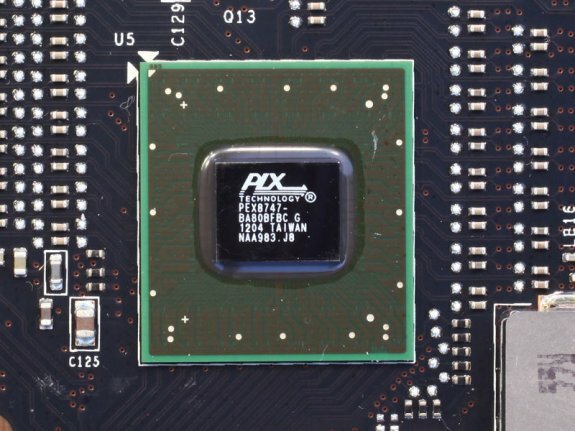 PLX reportedly saw high demand, which resulted in several companies bagging initial allocations of the chip, leaving others out to dry, with the part being listed as out-of-stock by its maker. Newer clients of the chip will have to wait until PLX undertakes the next big production cycle, to get their allocations of the chip. Casualties of shortage of the PEX8747 include the launch of AMD's ambitious Radeon HD 7990 dual-GPU graphics card, the various "HD 7970 X2" graphics cards, and high-end motherboards (eg: ASUS' Maximus V Extreme). NVIDIA's GTX 690 itself isn't readily found, either, and we are hard pressed to buy the "high-demand" argument that has been used to explain GTX 680 shortages, and to good effect, considering the GTX 690's scorching $999-$1299 end-user price. At Computex, we spoke with some of the graphics card vendors with so-called HD 7970 X2 models in the works. We learned through our conversations that some of them are hit by the shortage of PEX8747, which destabilized their product launch schedules, and that they are looking for "alternatives." These could include PCI-Express Gen 2.0 switches, which could hurt the products' specification sheets unless the companies balance it with [relatively] attractive pricing (at their expense of their margins).